We’ll get to the sales tip in a moment, but first you need the backstory: I’d received a referral for an aspect of the writing business that I don’t even do. (Public relations.) So, my initial part of the conversation was essentially an anti-pitch: “I don’t do that, but I’d be happy to refer you to one of my trusted freelance friends in PR who can help you out.” The prospect was very appreciative, and maybe a bit shocked. And, yeah, I was initially a little disappointed. You need to consider who sent the referral. This will give you important insights into the prospect’s expectations. In this circumstance, it was one of my graphic design partners, so I knew it was a quality sales lead. Had it been a prior client with whom I didn’t have good rapport or who’s always haggling for low prices, for example, I would have been wary. If the prospect doesn’t offer the name, you should ask! You need to be honest about your capabilities. 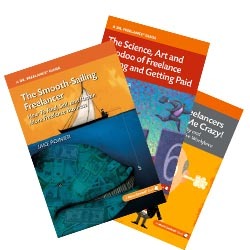 I gained a significant amount of credibility by playing it straight about my freelance business specialties. Sure, I could have ham-and-egged my way through a public relations campaign and made some easy money, but I know that’s not what I’m good at, and I don’t enjoy it. For that matter, it might have also been a disaster. If you think it’s a worthwhile prospect, do a little digging. It would have been easy for me to say “thanks, but no thanks” and ended the conversation early. I also didn’t have to help her find a public relations expert, but I took the time to do so. But the most important step was to just cultivate a slightly longer call by asking and answering a few questions. Who knows, maybe the person doesn’t need you right now, but you might make the call list the next time they do. It’s easy to have the mindset that a referral is a slam dunk. Sometimes they are; but when they’re not, you need to go back to your sales basics: Get the prospect into your sales funnel, and see what happens.